Apple Computer opens the first two locations of their new retail stores in McLean, Virginia and Washington, D.C. In the first weekend of opening, the stores will attract 7,700 shoppers and will sell a combined $599,000. 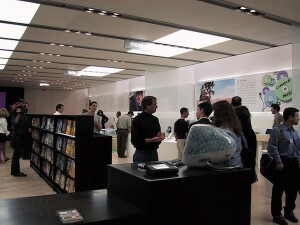 While ridiculed by many technology “experts” at the time, the Apple Stores have been insanely successful and was one of the key reasons for Apple’s resurgence in the 2000’s.